Ah, YouTube, the great equalizer. How untouched our lives would be if we’d never seen Filipino prisoners dancing to Michael Jackson’s “Thriller,” or “David After the Dentist?” These days, reality TV and the Internet have made celebrity as accessible—and conversely, as fleeting—as a few thousand clicks and a catchy viral video. On one hand, the landscape of pop culture has never been so within a regular person’s reach. On the other, well . . . you remember Chris Cocker? The “Leave Britney Alone!” guy? No? Neither do we. Do you care what gender-bender Jeffree Starr is doing now, or Tay Zonday of “Chocolate Rain” fame? Didn’t think so. But still, success stories keep on coming. Journey found their lead singer by looking up cover bands on YouTube. Indie pop singer Zee Avi was discovered on YouTube. And now, Inland Empire residents are discovering that YouTube is just the place to showcase their talents—without leaving their bedrooms. Meet AJ Rafael of Moreno Valley and Cathy Nguyen of Chino, two local musicians who’ve gained a hefty YouTube following. Rafael has more than 110,000 subscribers on YouTube, and more than 3 million channel views. Nguyen has over 70,000 subscribers and more than a million channel views. They’re part of the new wave of YouTube celebrities; their fansites are all over the Web, they have audiences from all over the world who give them feedback and their songs are heard everywhere—from iPhones in Ontario Mills to shared PCs in Southeast Asia. All this, with no help from major record labels, radio airplay or even sophisticated recording technology. While subscription numbers are always changing (at one point, Rafael was the 34th most-subscribed to musician on YouTube), Chris Dale, a YouTube spokesperson, says these numbers are pretty important. “If a crowd loves something, they’ll disseminate it,” he says. YouTube doesn’t really help influence these ratings, Dale adds. “We keep as low a touch point as possible [with these videos].” It’s a natural promotion. Dale says YouTube sees itself as the post office of videos. YouTube, after all, has worked for musicians big and small. Irish singer/songwriter Lisa Hannigan booked an appearance on The Colbert Report after he saw her video featured on YouTube. Celine Dion promoted her song “My Love” by encouraging users to use it as a soundtrack for their video. Dion got over 167 video responses (There was no prize involved, other than the promise that Dion would watch the video.). The 10-man a cappella group from Indiana University, Straight No Chaser, became an organic YouTube sensation when a group member uploaded a video of a December 2007 holiday performance. It got more than 8 million hits, and the group was offered a record deal by Atlantic Records. And there’s 16-year old DeAndre Way (Soulja Boy) who uploaded the song “Crank That (Soulja Boy)” to YouTube and MySpace, demonstrating the “Soulja Boy” dance. Five months after he uploaded the original video, Soulja Boy signed with Interscope Records. YouTube is such an undeniable paradigm shift in the way the music business operates that it has even spawned its own record label. Alan Lastufka, author of YouTube: An Insider’s Guide to Climbing the Charts and Hank Green of VlogBrothers started DFTBA Records (“Don’t Forget To Be Awesome”). The label produces and distributes independent music projects from artists who’ve made a name for themselves as YouTube stars. They manage digital music sales, CD production and artists’ merchandise. On the roster? Dave Days, Alex Day, Dr. Noise, Venetian Princess, Rhett & Link and Michael Buckley. Moreno Valley resident AJ Rafael grew up in a musical family; his father was a classically trained pianist, and Rafael explains, “I was forced to play the piano when I was five!” Now 20, Rafael took over their church’s piano duty when his father died 10 years ago. His father’s death inspired Rafael to pursue music seriously, and in 2003 Rafael started his MySpace account. Rafael credits MySpace with jumpstarting his music career; during MySpace’s heyday, he covered a Meg & Dia song that made it to the teenybopper duo’s homepage. People started following him from then on. Rafael began recording both covers and originals on his MacBook’s camera and started posting them on YouTube in 2006. Bred on old school R&B groups like Boyz II Men, pianists such as Vanessa Carlton and John Legend and singer-songwriters such as John Mayer and Jason Mraz, Rafael’s songs, whether on the ukulele, guitar or piano, are made in the same vein: sweet pop ballads. His voice is crystal-clear, with never a sour note in the mix. Having YouTube as a stage, he says, gives audiences and performers control. “I love immediate gratification,” he says. While people are able to give props instantly on YouTube, live shows are his real test, so he plays out live as much as he can. Because of his YouTube celebrity, he’s been invited to perform in places as far as Florida and New York City. Although he credits Asian boy bands such as Kai and New Emotion for inspiring him to stick to his own brand, he feels that Asian American pop musicians have a harder time breaking through mainstream media. “It’s really frustrating,” he says. He’s also been able to make a difference in the lives of others. Rafael founded the MoVal Concert Chorale (MVCC), used YouTube to raise more than $8,000 for his church. With a group of YouTube stars called Team Music, Rafael helped raise $6,800 during a “Walk for Autism.” More recently, he raised more than $4,000 for typhoon relief in the Philippines just by performing his songs on the Internet. Long-term, Rafael wants to be a household name. “My vision is to do my own thing, I work hard to have a lot of creative control in my music,” he says. Twenty-two-year-old Cathy Nguyen, a Chino resident, started her YouTube channel two years ago with her friend Randolph Permejo. Their videos—a mix of acoustic pop songs, soul and Christian R&B—have gathered over 1.5 million views, spread mainly through word-of-mouth. After performing with Rafael at a benefit a few years ago, Nguyen says she started getting recognized, with people requesting their appearances at school events and benefits. Unlike Rafael, Nguyen isn’t really out to be famous: “I just do it for fun, I post videos for people to enjoy it. I’m not really looking to get signed,” she says. Nguyen says she started performing music online because she’s been on a wait list for a radiology program. “When that happens, music will have to move down a notch,” she says. 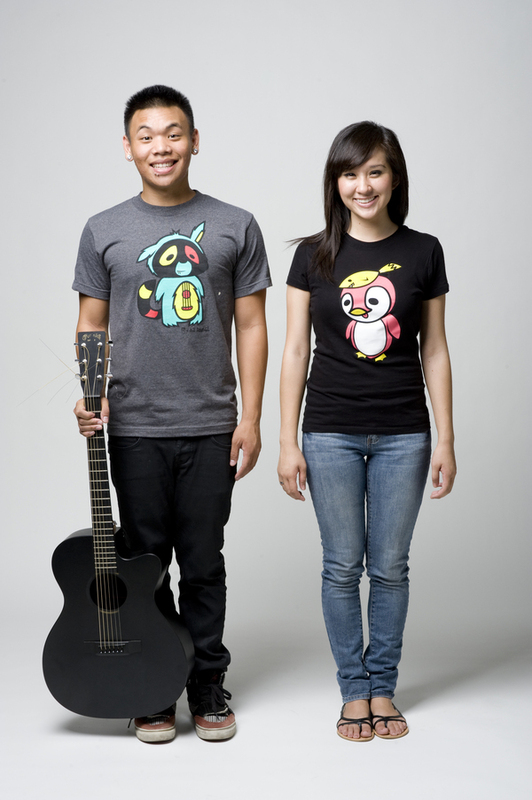 To check out AJ Rafael and Cathy Nguyen, go to www.myspace.com/ajrafael and www.myspace.com/cathynguyenmusic.